This template can help when there are a small number of schools and jobs to list. The fullness of the design lends itself to seem more "filled" than it really is. The highlights of this template are its large solid header with a large bold name as the main attraction in the main heading. We find this design with the name readily visible as well as the contact email address, which is the main point of contact in the modern job application process. Additional contact details for snail mail and telephone are closely placed below the main contact information at the top. The section headings are aligned to the left with the pertinent details on the right. For those with clean, consistent education and employment histories the placement of the dates on the right allows the human resources executive to quickly ascertain that you would be a reliable addition to the team. The solid horizontal rule clearly divides your most important info in the top header with your employment and education details below. To use this template effectively it will be best to have a clean career history so the dates have no gaps. The names of the schools you attended or companies you have worked for should not be too long so they don't crowd the other details. The same reasoning applies to the names of the cities. A job seeker that uses this template would be best served by taking extra care that the lines with the Education and Employment headings aren't crowded. The result of which would take away from the aesthetics of the design and make reading the accompanying details more difficult to read. Keeping all these details short and direct will be beneficial with this design. 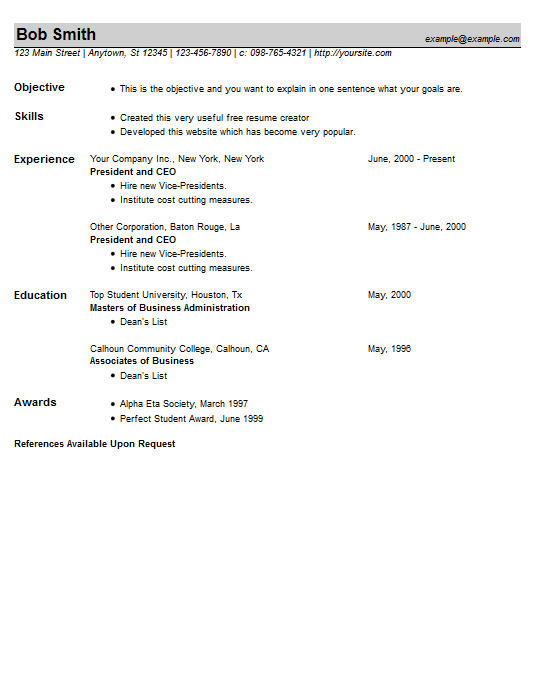 To use this template visit our Free Resume Creator.